The 22nd technical days of the French Chapter (CFH) of the International Association of Hydrogeologists were organized in Le Havre, Normandy, from 24 to 26 May 2018, in co-operation with the French Association of Hydrogeologists from Public Services (AHSP) and the University of Rouen. 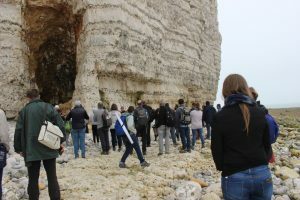 The event was devoted to the hydrogeology of chalk aquifers, with around 120 participants, mainly from France, but also other regions of Europe interested in chalk hydrogeology, such as England and Belgium. The topics covered current research questions and scientific challenges, and also the operational aspects associated with management, exploitation and protection of this resource. Accordingly, speakers came from diverse backgrounds – researchers, engineers from small and large companies and public organisations. The conference was organized in 3 thematic sessions, a round table, and 3 scientific and technical excursions spread over 3 half-days.